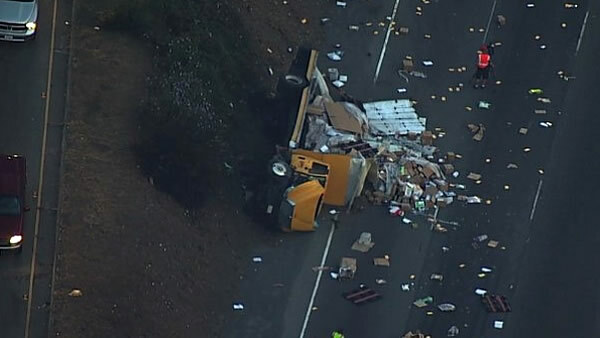 SAN PABLO, Calif. -- Two lanes of westbound Interstate 80 in San Pablo reopened following a big-rig crash early Friday morning. The lanes reopened and a traffic alert was canceled at about 9:50 a.m. on Highway 80 at San Pablo Dam Road after a big-rig crashed into an overpass and debris spread onto the highway. CHP Officer Kevin Bartlett said no one was injured and no other vehicles were involved in the mishap. The crash was first reported at 5:02 a.m.